I can’t believe that, of the hundreds of posts on this site, not one involves bacon. Well, I can believe it. I have never been a big bacon person, until recently. Don’t ask me why, but for awhile lately, we were eating bacon like it’s going out of style. Actually, here’s why: I still don’t like pork, but I only just discovered that turkey bacon is a pretty darn good facsimile. Surprise! Up until recently, I could count on one hand how many strips of bacon I’ve eaten in my life, but, hey, it’s never too late to catch up on my Lifetime Bacon Quota, is it? Bring on the turkey bacon. While you’re at it, wrap it around something green so I can call it a health food, mmkay? Of course, pork bacon or probably even vegan bacon would work for this recipe instead, if you prefer, but whatever you do, don’t skip the balsamic reduction. It’s incredibly easy to make, and tastes good on just about anything. 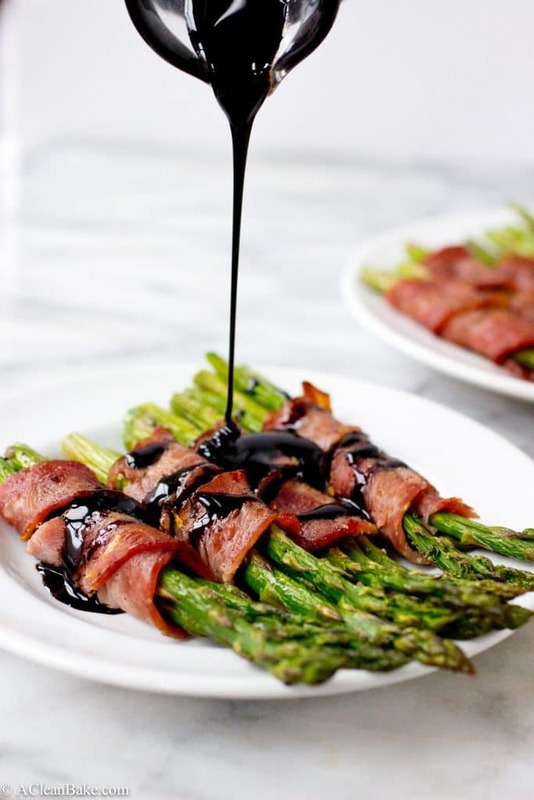 In addition to bacon wrapped asparagus, you can use balsamic reduction on/in meat, salads, other cooked veggies (broccoli would be great), grain salads, or even pasta. It’s a wonderful, flavorful, sweet-tart finish and you can immediately make any dish fancier by adding a drizzle of balsamic reduction. PS: For a while there, I was kind of having a can’t-stop-won’t-stop bacon moment, but now I’m a little sick of it, plus I realize it’s not the healthiest thing for you. So, don’t worry. I won’t take you down the Bacon Rabbit Hole with me (unless…do you guys want more bacon? Leave a comment if you’re on Team Gimme The Bacon.) But in this case, if it helps you get a serving of vegetables down the hatch, why not? 1 bunch fresh asparagus ~1 lb, rinsed and trimmed. In a saute pan over medium heat, stir the lemon juice and 1/4 teaspoon of black pepper into the balsamic vinegar and then cook, stirring or swirling frequently, until thickened and reduced to about a half cup of viscous liquid. When it has the consistency almost of motor oil, you'll know it's done. Turn off the heat and let it come to room temperature; it will thicken up as it cools. Meanwhile, preheat your oven to 350. Cover a cookie sheet or baking dish with a nonstick pad, parchment or oil. Thoroughly brush the asparagus with the olive oil, making sure to coat each spear completely. On a large cutting board or other clean workspace, lay out the halved bacon strips and sprinkle with the remaining black pepper, the lemon zest, and the minced garlic. 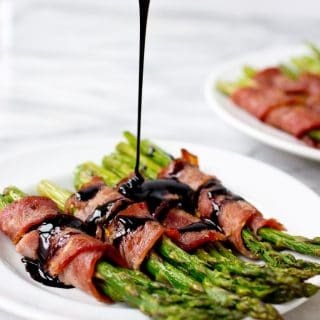 Roll one strip of bacon around each spear of asparagus (being careful to keep the seasoning inside; use multiple spears if you have very thin bacon) on a slight diagonal so that it covers most of the asparagus. The ends can poke out as much or as little as you'd like. Transfer to a serving plate, drizzle with balsamic reduction, and serve immediately. 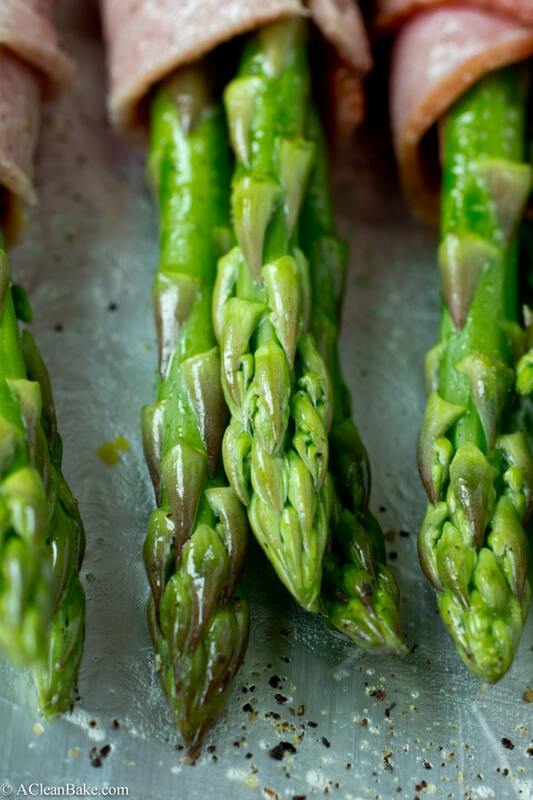 PS – that close-up picture of asparagus had me wanting to reach out and grab it – so gorgeous! The balsamic syrup is SO easy to make and much cheaper than buying it, it seems. I used safeway store brand balsamic as the base (read: not fancy) and the resulting syrup tasted much higher quality than you’d think given the base. So, go to town! PS: That’s exactly what I was hoping for so THANK YOU! I’m currently in the process of carb purging (too much buttercream during the winter months 🙂 ). In the first few weeks I tend to consume more bacon than I ever dreamed possible. Well that. . .and prosciutto wrapped asparagus (had this last night). I love the super saltiness that it brings to the asparagus. I’m loving the balsamic reduction you added to this easy, yet elegant side dish and once I get through this first month…I might just have to add that for a special treat. This is also a great side dish for dinner parties. I hear ya! That’s the story of my life these days, sadly. It’s flavorful and slightly fancy-feeling dishes like these that get me through. Or maybe it was just the bacon. You might be on to something there! Prosciutto would be great too, I’ll bet! I’ve made that for other people and it’s always a huge crowd pleaser. The balsamic reduction is a really nice way to set off the saltiness of the bacon (or prosciutto) – and it’s also great on salads, or (when you are back on the carb train) to dunk bread in! I’m definitely on team GIMME THE TURKEY BACON! It’s so delicious and not too bad for you. Love the balsamic addition – I have the bottle from Trader Joe’s, so these babies are going down soon in my kitchen. I LURVE bacon! And not just pork bacon..basically any bacon you can toss at my face. I’ll wrap anything in any type of bacon, slam bam thank you ma’am, just gimme all the bacon + balsamic drizzle, puh-lease! Your pictures are absolutely gorgeous! They make me want to wrap bundles of asparagus in bacon and eat them for breakfast right now! Have a great weekend, dear! 10 points right out of the gate for using the chronically-under-appreciated term “lurve”. I feel like your can’t go wrong with bacon perspective is probably widely shared, so maybe I should step it up in the bacon department!! Thanks for pinning, Christina. Have a great weekend! Yeah! I love bacon wrapped dates too. I am trying to keep my sugar intake low these days (when will it ennnnnnnnnnnnnnnd?!) so I had to try something new. It isn’t quite as sweet, but it still works great! I have never tried Tapas Barcelona but I have wanted to for a long time. Let’s plan a lunch date soon! I had something very similar to this at a local 5-star restaurant about a year ago that also included some crumbled Feta and pine nuts on top. I have attempted to wing it on my own several times, but it never was exactly the same. Your method is very helpful, and it never crossed my mind to add lemon like you have! It sounds like a wonderful addition and I will definitely try it! That sounds just great, Diane! I was thinking chopped walnuts might also be a great topping 🙂 I hope this turns out as well for you as the restaurant version! Thanks, Kim! 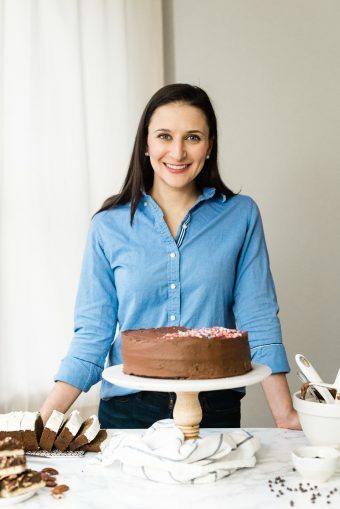 I really appreciate that you included this recipe in your post! 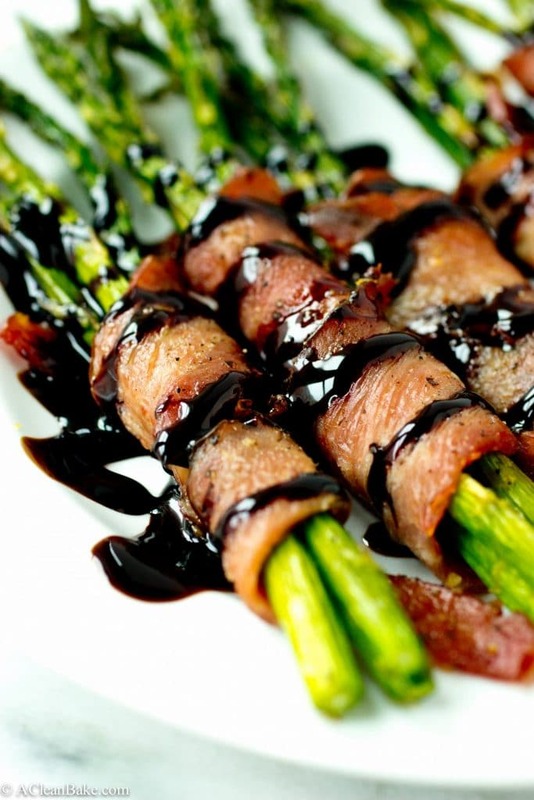 Huge fan of grilled asparagus and bacon. Loved and enjoyed the chance to give this a go. Just a tiny micro dash of Italian shredded cheese and there wasn’t even a chance at any leftovers. Delicious. With a girlfriend on Paleo, this was the ticket. Thank you. It would be very helpful if you noted the number of servings this recipe makes, and the nutrient analysis.